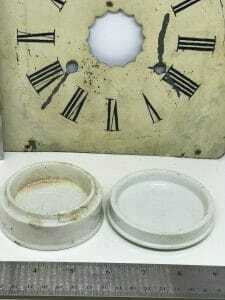 Measures approximately 3” diameter x 2.5″ tall . 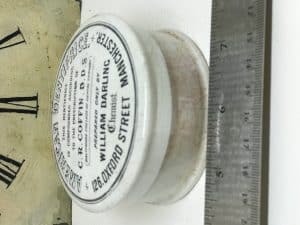 This is a listing for one (1) American Dentrifrice Tooth Paste Lidded Pot with Base Advertised as: This dentifrice is compounded according to the prescription of C.R.Coffin. D.D.S. Baltimore College of Dental Surgery prepared by William Darling, Chemist.